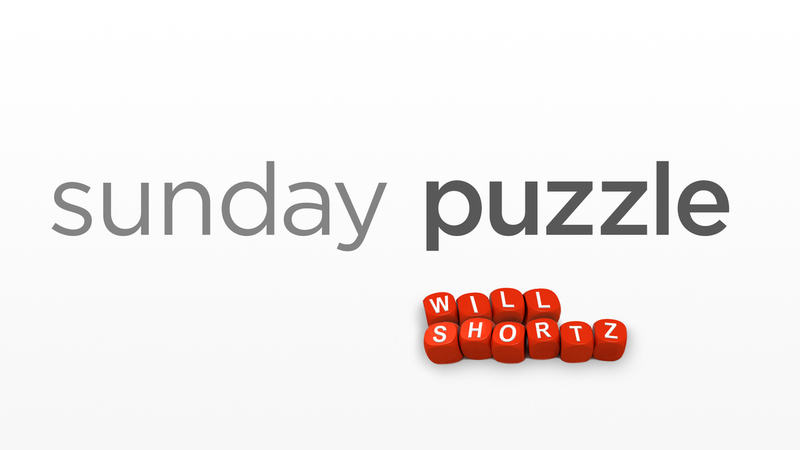 Sunday Puzzle: Catch Me If You Can NPR's Lulu Garcia-Navarro and puzzlemaster Will Shortz play the puzzle with Gary Lees of Key Biscayne, Fla.
On-air challenge: Tonight I'm going to be on the Fox sitcom "Brooklyn Nine-Nine." In today's puzzle I'm going to tell you my experience in filming the show. Anytime you hear an error of fact, logic, or word usage, say "Buzz!" and explain why. And just so you know, no specialized knowledge is needed. As I mentioned, I'm going to be on the ABC sitcom "Brooklyn Nine-Nine" tonight. It's a police situation comedy set in Brookline, Mass. Andy Samberg plays detective Jake Peralta, whose girlfriend and fellow detective Amy Santiago loves the crosswords I edit for the New York Post. Tonight's episode is called "The Puzzle Master." Jake and Amy investigate a series of arsons, for which I play a suspect. Last December I flew to San Francisco, so I'd be near the Universal Studio in Hollywood, where "Brooklyn Nine-One-One" is filmed. The set recreates several square blocks of make-believe Brooklyn. I had to join ASCAP, the actors' union, in order to do the show. I have several lines in the episode. And at one point I'm seen stepping out one of the bluestone houses that Brooklyn is famous for, before glancing around suspiciously and walking down the street. Everyone on the set — the actors, writer, producer, and makeup artists — were super-nice. That especially goes for Andy Samberg, who happens to share a last name with NPR's Susan Samberg. The show airs at 8:30 am tonight. I look forward to seeing how it turned out. Last week's challenge: This week's challenge comes from listener Eric Iverson of Eagan, Minn. Pick an even number between 1 and 10 that's 1 more than four and 2 more than ten. Answer: Eight is 1 letter longer than four, and 2 letters longer than ten. Winner: Gary Lees, Key Biscayne, Fla.
Next week's challenge: Name part of the human body. Insert a speech hesitation, and you'll name a country. What is it? If you know the answer to next week's challenge, submit it here. Listeners who submit correct answers win a chance to play the on-air puzzle. Important: Include a phone number where we can reach you Thursday, April 12 at 3 p.m. ET.